Created for Toronto Game Jam (TOJam) 13 "Flirteen with Disaster." The theme was "Winning is for Losers." This has been slightly updated from the jam version. Controls: use arrow keys to change direction, and Z or X to jump over bombs and monsters. 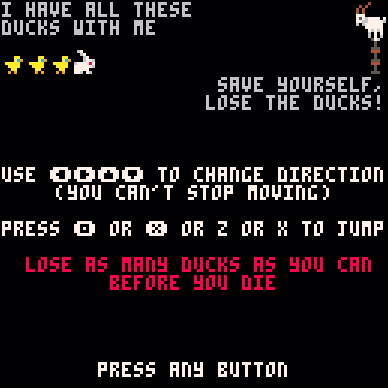 The goal is to lose all the ducks!